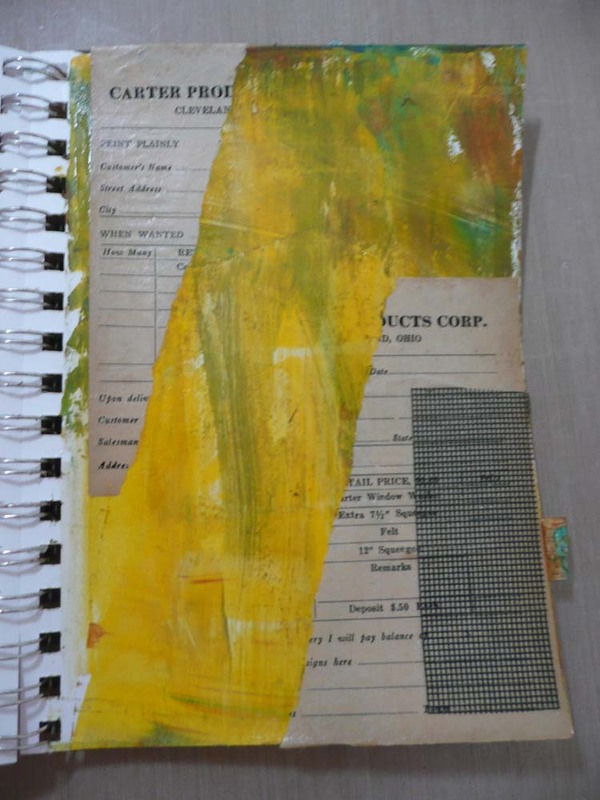 Today is day two of my posts about the art journal technique called Journaling by 5s by Shannon Green. 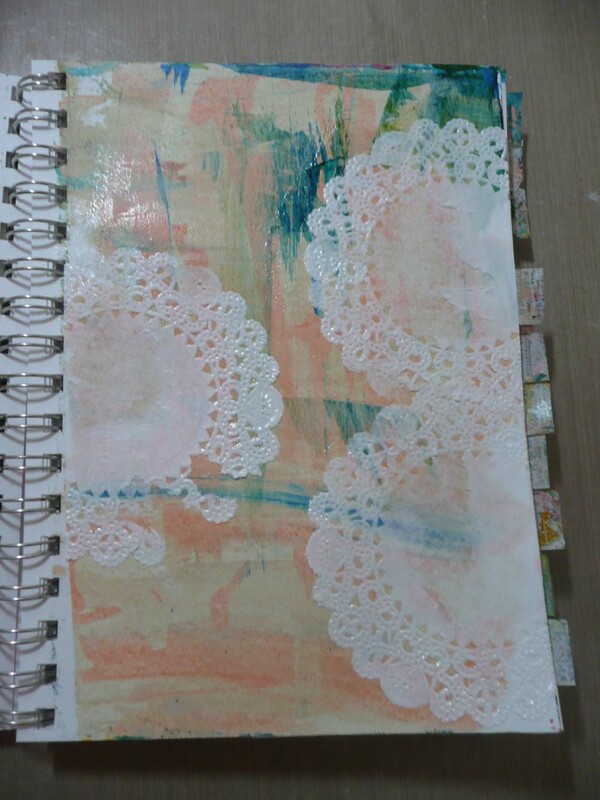 As a quick recap, yesterday I had 15 minutes to put paint and/or ink on 20 pages of my art journal. 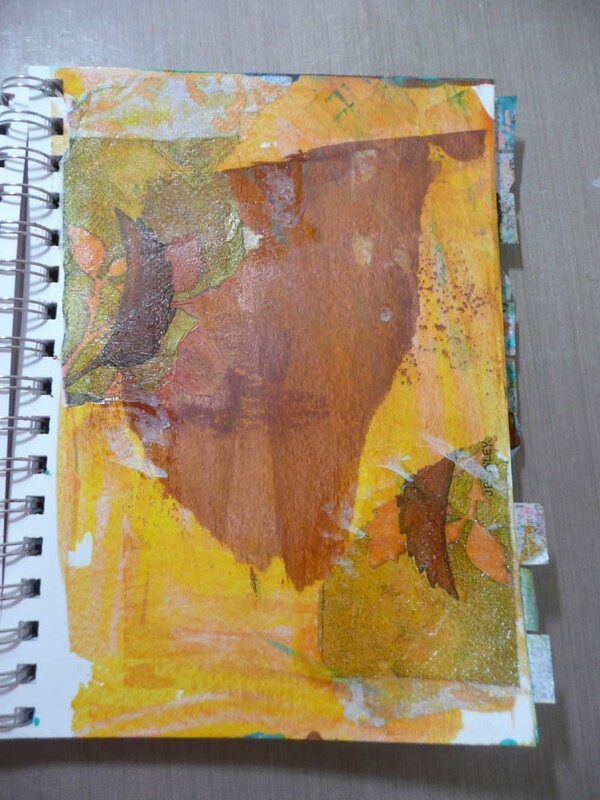 Today I had just 15 minutes to collage and use recycled papers to add texture to the pages. Here are some pictures of this disaster session. 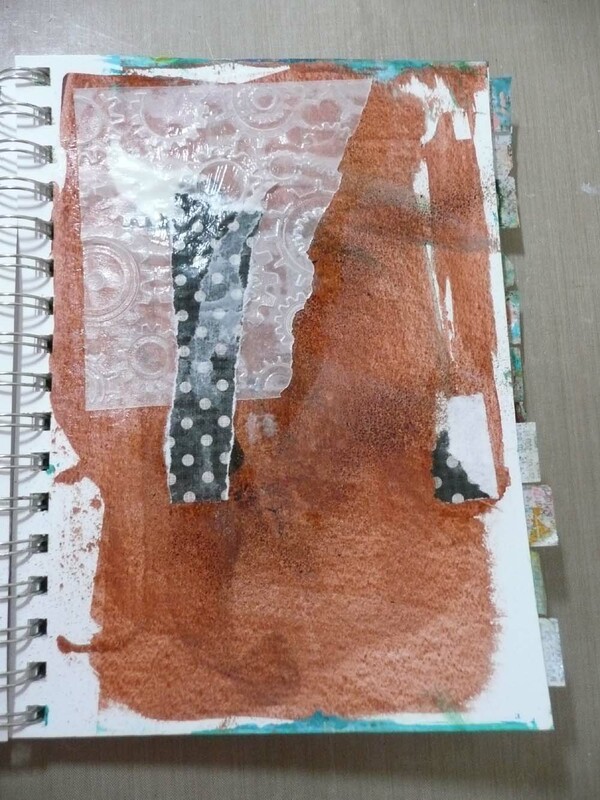 Pile of paper scraps to add for background texture. 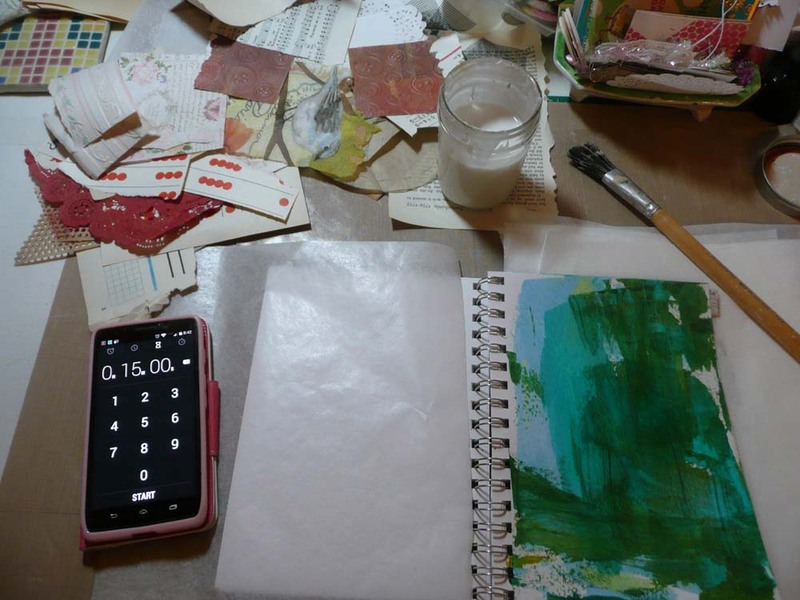 Mod Podge, timer and journal at the ready. Old receipt paper and some kind of black plastic mesh. Paper doilies, one of which was mutilated when I tried to separate the stuck together pages. 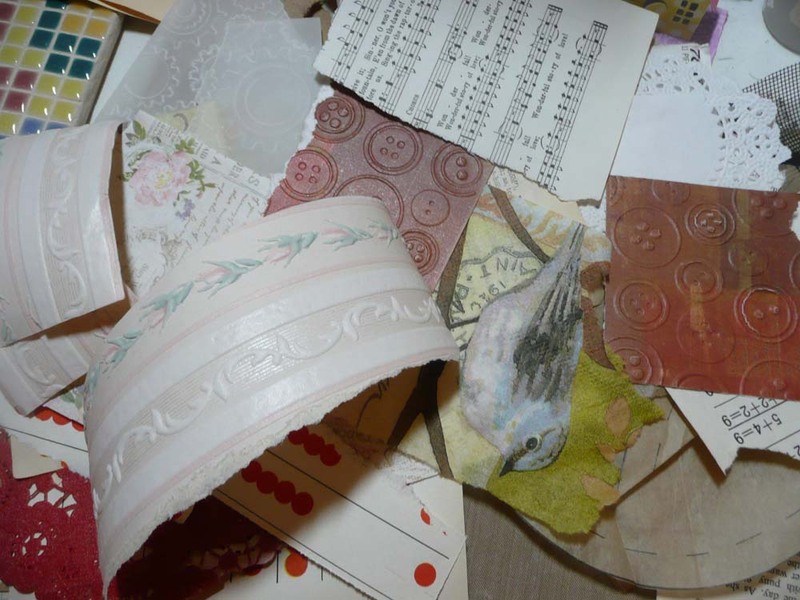 Paper napkin pieces which almost made me use sentence enhancers as I was trying to glue them down! I have to confess that I was not able to complete this session in 15 minutes. It actually took me 30 minutes because everything was sticking to everything. Even though I put wax paper between each page as I went, the wax paper stuck too. It just took me 15 extra minutes to peel the wax paper off the pages. I did not move anything though, so it stayed the way it was originally slapped down. If I do this again, I need to reconsider my adhesive choice! Because of the sticky mess I must say this was a rather stressful session. Stay tuned for tomorrows session and another picture of the heinous page! The heinous page looking even more heinous than yesterday!